Oil-less & low noise pressure pump for research laboratories. Air purity mainly depends on pressure pump technology. Oil-less pressure pumps deliver cleaner air by avoiding oil microdroplets generation. With a very quiet operation (noise level below 50 dB), this silent pressure pump station can be set up directly close to working laboratory members. Because of their low footprint design these Benchtop Air Pressure pumps are easily transportable and fitted for quick installation in the smallest spaces in any research laboratory. 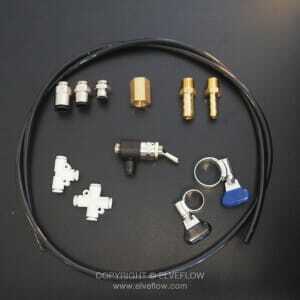 WHAT'S IN THE PRESSURE PUMP KIT? In chemistry, life sciences and biotechnology research laboratories, clean compressed air is required in many protocols for various tasks such as filtration, degassing, distillation and many other operations such as cleaning silicon wafer using blowguns. Here are some key features points to consider when comparing compressors. 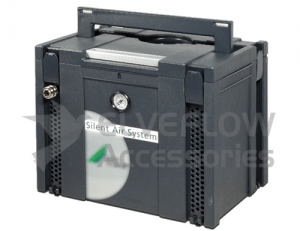 this sound isolated station offers an oil free air pressure pump in a easy-to-handle box, making it particularly well suited to research laboratories needs. To facilitate the setup and first use, it comes with all required couplers and fittings, and a mains plug (1 ~ 230 V), installed directly on the casing. This oil-less pressure pump is a very reliable pressure pump that does not require maintenance, to maintain a high level of performance. 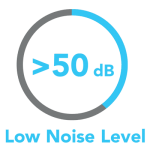 WHY USING AN OILLESS AND LOW NOISE PRESSURE PUMP IN A RESEARCH LABORATORY? BECAUSE AN OILLESS AND LOW NOISE PRESSURE PUMP IS AN ESSENTIAL TOOL FOR A RESEARCH LABORATORY. A pressure pump, also known as a compressor, is a major device in modern labs. It can be used for a large number of tasks, from providing clean oil-less air to Microfluidics Pressure Controllers, to wafer cleaning procedures using an air blow gun. 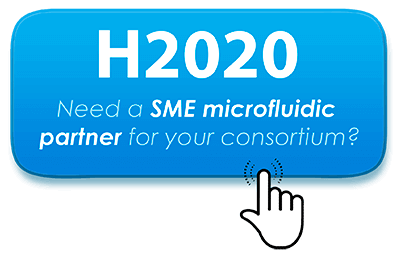 Where to use it in your microfluidics setup? An oilless and low noise pressure source for a research laboratory is, as the name implies, the pressure source of a microfluidics setup. Therefore this low noise pressure pump should be placed upstream of a pressure controller to inject oilless and clean air. How to connect your OILLESS AND LOW NOISE PRESSURE PUMP IN A RESEARCH LABORATORY? Before buying an oilless and low noise pressure pump for a research laboratory, you should get information about the AC Voltages and Frequencies that exist in your country. Gather together all the elements of your oil-less and low noise pressure pump for a research laboratory and carefully read any User guide and document provided. Then then save them in a precise place to consult it in the future. Link your oilless and low noise pressure pump for research laboratory to your flow control device using pneumatic tube. Connect the mains cord of your oilless and low noise pressure pump for research laboratory in any electrical outlet of your lab. Note: as many plug & socket forms exist, you may check that the elements provided with your oilless and low noise pressure pump for research laboratory are fitted to your country norms and lab equipment. Press the power button of your oilless and low noise pressure pump for research laboratory and enjoy the clean and quiet air performance. This equipment does not come with any fittings or pneumatic tubing. If you need these components, see the companion products below. Connect your instruments to a pressure source (compressor) or a vacuum pump. The pressure source quick connection Kit contains pneumatic tubing and fittings to connect a compressor or a gas cylinder to your setup within minutes. 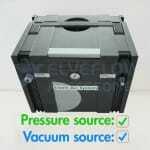 PRESSURE SOURCE & VACUUM PUMP IN THE SAME BOX! The Dual Pressure & Vacuum Generator is designed for modern laboratories needs, and delivers Pressure & Vacuum at the same time on separate channels, making it a smart add-on for your lab equipment and an essential tool for a wide variety of laboratory processes.